I've been having intermittent problems with my Superhawk. I get it running well and a few days later or a trip to the track and it starts running poorly again. It's definitely a carb issue. I bought the bike a few months ago and it had been sitting for a few years. It had aftermarket MIG exhaust, K&N air filter, and Micro Jet kit installed. The jet kit included new needles and mod (3 holes) to the lift holes. After a thorough cleaning and tuning and balancing, it started reliably, ran excellent above 3500rpm, but still sputters a bit below. I replaced the mains with size 48 jets and this made it run better down to about 2500rpm, but still sputters a bit below. Last weekend I went to the track (Summit Point) and it ran great until the late afternoon. Then it started missing and had no power above idle. I would idle fine but cough every time I twisted the throttle. If I slowly apply throttle it would only climb to about 3000rpm before missing. Pulling the choke would kill it instantly, so I'm thinking maybe I sucked something in the intake, but I found no intake clogs or issues. I opened the air box and ran it open but it's still missing. That was my second trip to the track and second time it started running poorly after a few sessions so I'm losing confidence it the SH's reliability. This weekend I decided to go back to a stock carb setup and just tune via shims on the needles. I bought all stock replacement parts on Partzilla last month. I opened the carbs today and found that the stock carb slide springs are TWICE as long as the one currently installed. Can that be right? I double checked the part numbers on Partzilla and the long stock ones match. It's hard to believe the stock springs a so much longer so I'm checking in with the experts here. Any advise? 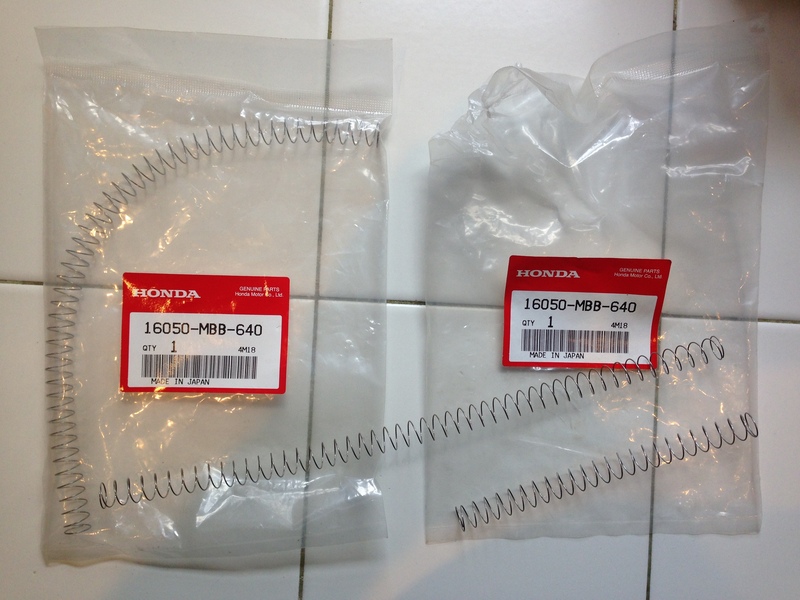 Hers a pic of the stock (long) slide spring and the Micron (short) spring along with the stock part numbers. Don't lose confidence in reliability due to carb tuning issues. I've owned mine just shy of 10 years and it recently turned 30k (which isn't a high number compared to some guys here) and has been 110% reliable. So if someone modded the lift holes, you can't really go back to stock, yes? I spent the day reading the various tuning threads here and settled on making the following changes. - I epoxied lift holes on forward carb so now I have only one lift hole. - I epoxied one lift hole on the rear carb so now there are two. - I shimmed the rear needle .020 in. It started right up and after a few minutes warm up, I set the idle and sync'd the carbs. It seems to be running well now. I took a short ride but it's starting to rain so it was very short. Idling in 2nd and 3rd around the neighborhood and it's not coughing - that's good. I took it out on the main road and opened it up a bit - seems good but maybe a bit less power than before. It's hard to say after only a short ride. It's definitely running better and no missing or coughing but I'll take it out again tomorrow before I close the book again. Sounds like you're headed in the right direction. Can't complain though, we really needed this rain. It also knocked the edge off the sweltering heat. The carbs have Micron jet kit needles. The profiles look stock but that are adjustable and have 6 grooves. I had not changed the needle settings at all because I figured before the bike sat, it was probably running and I have the receipt from the PO having paid a motorcycle shop to install the kit. Until today both needles were set with the clip on the 3rd grooves and a thin washer beneath each. Today I added another thin washer beneath the needle on the rear carb. I did not change the springs back to stock yet. As an update to this thread, I did finally get the SH running perfectly now. I had to remove and clean the carbs again - not sure what was stuck in there, but I suspect a little bit of foam from the EGR tubes. I found bits of that same foam inside the carb slides. I have the K&N air filter and EGR block-offs. Now, I've sealed the block--offs in place to prevent intake leaks. I also did the COP mod last month. It's a very easy mod and cleans up the wiring nicely. I've been to 4 track days since the repairs and the SH has performed very well. I'm still struggling with a slightly slipping clutch. I'm certain it just needs to be bled more, but it's a total PITA. Now I'm looking to get a bit more power or lose some weight or both. I'm looking at doing a 520 conversion next and adding a couple of teeth to the rear sprocket. The stock gearing is just so tall. Try timing advance, either 2 or 3 degrees. Sync your carbs a couple times a year too. I'm still struggling with a slightly slipping clutch. Look veryclosely at the point where the clutch lever engages the pin from the master cylinder piston. If the pin is not in the recess provided in the lever's round bushing you will get a slightly slippy clutch from the constant pressure.